The Powder Tower has long been a symbol of Prague’s Gothic Period. 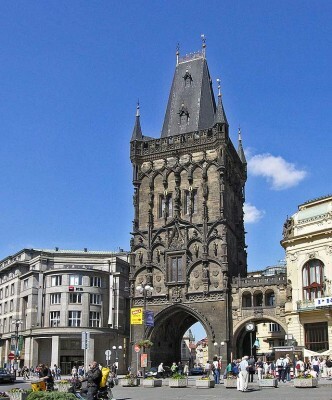 Located in the center of Prague, the tower functions as the gateway to the royal route. Until the 1830’s it was used by monarchs making their way to St. Vitus Cathedral. Construction for the Powder Tower began in 1475. Mastous Rejsek was the famous architect charged with the task of creating the Powder Tower as one of Prague’s original 13 city gates. Although construction began in 1475, the tower was not completed until 1485 due to fighting and the takeover of King Vladislav II royal reign. After the King moved his castle, the Powder Tower remained in usage by the Bohemian monarchs until 1836 as a ceremonial passage way for their coronation. The use of the Powder Tower began to steadily decline as Prague began to transform into a bustling city. By the 17th century, the tower’s primary usage was as a storage unit for gunpowder, thus giving it its current name. Poor maintenance and environmental damage affected the tower in the 1700’s, but a restoration project took place in the late 1880’s to restore the tower’s historic beauty. Josef Mocker, a master builder, was in charge of the first restoration project in the late 1880’s. More than a century later, the Powder Tower was restored again as an attempt by Prague to revitalize the many historical buildings, gates and structures in the city’s center. The tower’s beautiful stone statues, coat of arms and facades were all restored to their original charm, thus making it a popular tourist destination. The Powder Tower was the largest of the cannon towers that were supposed to protect the city. Whether or not its defense mechanisms worked were never tested. However, it remains as one of the few original structures of Prague’s Old Town.